It Will Always Be Us is the third book in the Fitz Series from the supreme storyteller Theresa Sederholt. It is a clever and thrilling suspense that has some drama, mystery danger, secrets, betrayal, action…. and so many more intriguing elements, that I was completely engrossed in the story by the end of the first chapter. This story could be read as a standalone- but, I really do recommend reading the first two books before embarking on this one, as they lay down some of the framework for the series, as well as introducing all the recurring characters- all of which really sets you up to get the best out of your reading experience, not just of this book but the overall series. As I have come to expect from Ms. Sederholt, the story is quite complex, where we get multiple points of view, as well as some twists and surprising developments- making it feel like we’re getting a whole lot more story than first meets the eye. Ms. Sederholt masterfully choreographs all the elements into a fast paced, thrilling, and seamless read. Having read the first two books and loving them as much as I have, I really had some high expectations for this story- so, I am really happy to say that Ms. Sederholt didn’t disappoint, delivering everything I could have hoped for, and then some. It’s really hard to pick my favourite from the three books so far, because they really are so fantastic, but I think this one has managed to get ahead of the other two, just. There is a brilliant puzzle to unravel in this story, with epic tension and intense suspense, I spent most of the time on the edge of my seat, holding my breath as the story played out. As with the other books, this really is an emotionally charged and gripping read- and a very worthy addition to this first-rate series. Fitz, who we met in the previous books, has been called in to help a widowed mother of three, to figure out the puzzle that her husband’s death has created. Things just don’t add up, and Fitz has a bad feeling that things aren’t going to end well. Danger is a lot closer than they realise and lives are on the line. What did her husband get himself into? Can Fitz figure it out before it’s too late? Once again Ms. Sederholt kept me completely spellbound with this gripping tale. I loved following along with Fitz on this investigation, putting all the pieces of the puzzle together and trying to figure out what was going on. I also loved catching up with all the characters from the first book- his loving, close-knit and supportive family (although somewhat quirky) and work colleagues, really are such wonderful characters. I am in awe of Ms. Sederholt’s creative abilities, and how she manages to produce such incredibly well written stories, every time, and making it seem effortless. This is one of my all-time favourite series, from an author on my must-read list. Now I really can’t wait to get my hands on her next book. It can’t come soon enough! 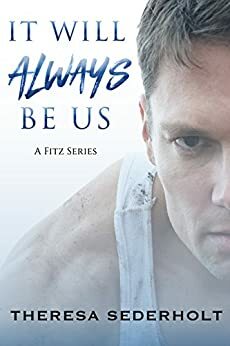 It Will Always Be Us is the third book in the Fitz Series by Theresa Sederholt who has written a very clever and complex story that is as thrilling as it is suspenseful. The story is told from multiple points of view that adds to the dynamics of the mystery and drama. This intriguing story had me enthralled right from word go. There are so many pieces to the puzzle to put together to make it a cohesive tale which Theresa does so well. The story starts with secrets and lies, betrayal and hurt, that leads to danger and mayhem. As you navigate all the twists and turns you come upon some very surprising developments that you just don’t see coming. This is a very emotionally charged story so recommend a good stiff drink on standby as you watch this mystery unfold. I can’t wait for the next book. I simply love this series. It Will Always Be Us is the third book in this exciting series. As with books one and two Theresa hasn’t missed a beat with this book. I do feel it can be read as a standalone but do say to start at the beginning for background history on characters. I don’t know which book so far, I would pick as my favourite as I feel they are all great to read. This book does do some character hopping, but I will say it’s done with Theresa’s beautiful writing style so there will nothing about the story that will leave you even a little bit confused. So, what we have in this book is Bailey who by a stroke of bad luck has been left a widow and a single mum to three after her husband dies suddenly of a heart attack. Bailey finds something strange behind a photo while packing her husband’s office and takes it to her best friend Gail who knows just the right person to sort out what her late husband has left behind. Fitz is the man for this job and as we all know he can’t say no easily to anyone. Will Fitz be able to help Bailey sort out what her husband has left behind? I can honestly say no-one is going to be disappointed with this book. I'll be honest, When I saw this book was available I think I screamed out loud like a little kid...I so very much loved Books 1 and 2 and these characters are among my favorites ever!! I am having a hard time choosing which of the three is my favorite so I'll just say the whole series is up in my top 10 series of all time. This author writes exactly how I love for a book Im reading to be written...Her storylines touch me like no other, and the way she can throw in so many different POV’s without me ever getting confused is spot on!! I love knowing what is going on throughout the whole story with everyone and this is done flawlessly in this book! I've decided Fitz needs his own TV show, I just love him and his relationship with MJ is awesome, and how MJ keeps him and everyone around her in line actually always makes me smile. I truly never want this authors books to end when I'm reading them, and I'm praying that there is more to come for everyone in these books..I do not want this series to end! For now though it's time I read everything else this author has available...She is beyond amazing and definitely has received a new forever fan!! This is the third book in the Fitz series and I must say I think it blows the other two books out of the water . Fitz and the family are back and this time they are trying save one of their own after a case takes them to the edge and back. When Bailey is trying to come to terms with her husbands death , she finds something that leads her and her children into danger . She needs help to figure out what is going on and why is everyone lying to her . Enter Fitz and his team to figure it all out . But will they get it all figured out before its too late . This story has it all , intrigue, mystery and yes romance . The characters just keep getting better and more complex. Fitz is more laid back and happy in this book . He has his friends and his MJ and his family . But when push comes to shove he is there for anyone that needs him. I really like him, he is the type of guy that will love and protect you . MJ is back and still is as sweet as can be she helps keep him sane and safe . We find out more about some of the rest of the crew , we find more out about Gail and the rest of the guys . Bailey is such a complex character. She has gone through so much but she is also very strong for all that she is going through. I truly like all these characters, they are like part of the family . I can't believe I sat down and read this book in a day . I couldn't get enough the author had me on the edge of me seat the whole way through . There were a couple of times I had tears in my eyes . Especially towards the end . I am not going to tell you what happens but trust me you will have tears in your eyes . You could read this book as a stand alone but if you want to get to know the characters better you should read the first two books in the series . I really hope the author continues to write this series . I am sure Fitz can get into more trouble if he tries hard enough . lol . So if you want a great read for you summer reading list check out this series . You will not be disappointed. The story It Will Always Be Us (A Fitz Series Book 3) by Theresa Sederholt is a thrilling/suspense book that I loved reading. It is a series that I found just kept getting better and better with each story. Reading is like putting together a puzzle with many pieces. It had me on the edge of my seat wondering what was going to happen next. Not only does it have a storyline that will keep you guessing it has amazing characters that are likable and that you want to succeed in their investigation wherever it leads them. One of those characters is Fitz. He is a man that can’t say no when he is asked to help those who otherwise can’t help themselves. This time he is helping Bailey Davis. She is a woman who has found her world drastically changing and not in a good way. She has questions that she wants the answers to and she turns to him for help. The compassion that Fitz has and also the determination to find the truth is the reason that I love his character so much. The cast of characters in this book are many and a lot of them are those who Fitz calls family. The loyalty and bond between them is very strong. When Fitz starts uncovering the truth how much danger will he and those who are helping him find themselves in? There are times in this story when I would find myself holding my breath and others that I found myself with misty eyes because of an emotional scene. This is a well-written story with unforgettable characters. As previous situations are referenced and characters are brought forward in each book I would suggest reading them in order.